Per Molander was the recipient of the 2016 Essay Prize from the Swedish Academy. He is the author of numerous reports, articles, and books about political philosophy and policy. He has consulted for the World Bank, the Organization for Economic Co-operation and Development, the European Commission, and the Swedish government. Presentation held during the Disruptive trends for global sustainability workshop. 26th of March 2018 in Stockholm. What is the origin of inequality? Can inequality be affected? 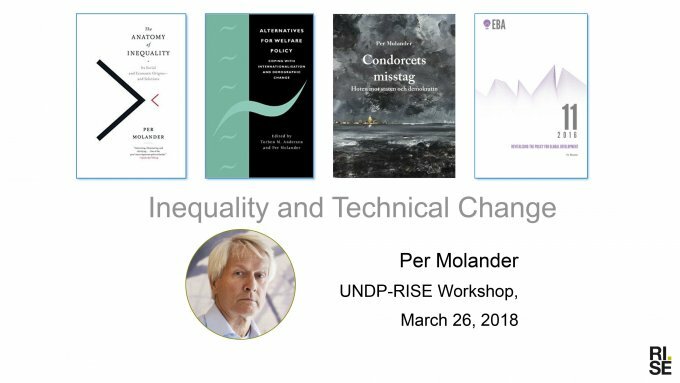 What is the relationship between technical change and inequality?